If you'd like to purchase bags of rings for your own knitting, see the Rings and Tools section. Need help with pricing? E-mail me. .
To download the order form in PDF or Rich Text format, click . Don't have the reader? Click Here for the Windows version. Need help filling out the order form? E-mail me with your questions. Galv. Steel 14AWG 1/2" 0.07 750 rings/sq. ft. 44.1 oz. Galv. Steel 18AWG 3/8" 0.07 1200 rings/sq. ft. 19.83 oz. #304 Stainless Steel 14AWG 1/2" 0.07 750 rings/sq. ft. 43.4 oz. #316L Stainless Steel 1/16" 3/8" 0.07 1200 rings/sq. ft. 21.11 oz. #316L Stainless Steel 1/16" 1/4" 0.07 2400 rings/sq. ft. 14.82 oz. #316L Stainless Steel .035" 3/16" 0.07 4800 rings/sq. ft.
#5356 Aluminum 3/32" 1/2" 0.07 750 rings/sq. ft. 19.7 oz. #5356 Aluminum 1/16" 3/8" 0.07 1200 rings/sq. ft. 6.4 oz. #5356 Aluminum 1/16" 1/4" 0.07 2400 rings/sq. ft. 4.7 oz. Brass 14AWG 1/2" 0.07 750 rings/sq. ft.
Brass 1/16" 3/8" 0.07 1200 rings/sq. ft. 21 oz. Brass 1/16" 1/4" 0.07 2400 rings/sq. ft. Bronze 0.040" 1/4" 0.07 2400 rings/sq. ft. Bronze 0.040" 3/16" 0.07 4800 rings/sq. ft. Bronze 0.040" 1/8" 0.07 12,000rings/sq. ft.
Red-Enameled Copper 19AWG 3/16" 0.07 4800 rings/sq. ft..
Red-Enameled Copper 19AWG 1/8" 0.07 12,000rings/sq. ft.
Sterling Silver 0.040" 1/8" 0.25 12,000 rings/sq. ft.
14K Yellow Gold Filled 0.032" 1/8" 0.30 12,000rings/sq. ft. Almost as light as aluminum, 3 times stronger than steel, as safe as medical grade, and in colour! 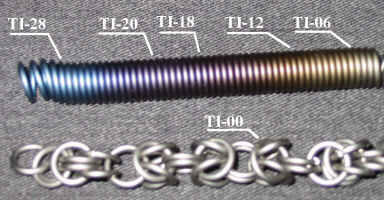 The colour chart at left shows the cool colours available with titanium. The bottom chain is natural grey. Please specify colour by TI# when ordering. See the Rings and Tools section for bags of rings if you'd like to knit it yourself. Most folks selling titanium wire are offering Commercially Pure Grade#1 titanium, while I offer Grade #19 (6AL4V). What's the Difference Between Grade #1 and 6AL4V? Grade #1 is softer, easier to work with if you're making jewelry. 6AL4V is about as tough to work with as #316 stainless steel - still within the limits of human endurance - and it makes much stronger chain mail garments and jewelry. What's the Difference Between 6AL4V and 6AL4V-ELI? 6AL4V is made to the same chemical composition and exacting standards as 6AL4V-ELI, or medical grade titanium. 6AL4V-ELI is the stuff that surgeons use to pin bones together. Each 6,000 lb. billet of 6AL4V-ELI is tested to determine its exact chemical composition after manufacture. This ensures that the product manufactured can be used for implantation in the body without fear of the body rejecting it. This certification process pushes up the price dramatically with no benefit to the chain knitter. Using the above table and the following calculations, you can determine approximate pricing of any garment yourself. This calculator assumes European 4-in-1 knit. For 6-in-1, double the pricing and delivery. Note that the calculator currently has no checks for rings that can't be double-knit. This calculator assumes European 4-in-1 knit. For 6-in-1, double the pricing and delivery. Note that the calculator currently has no checks for rings that can't be double-knit. Other rings will be added to the calculator in future. Bras and bikini tops are tricky because each woman is different and each bra has to fit well, look good, be comfortable, and provide support. Some have adjustable leather ties for the top and bottom, some do not. Some are knitted with a double-knit for more modesty, some can make cleavage where there was none before. Because of this, the following instructions will only produce a rough estimate of price for a single-knit bikini top with leather or satin ties for top and bottom. After taking these measurements, contact me for pricing and style options. As an added bonus steps 2, 3, 4, and 12 will yield your actual bra size. Most women don't know their own bra size, and even fewer know how to properly measure for it. 1) Put on your best bra. Measure under the bust from the boning or seam under one arm to the other and note this measurement in inches. 2) Measure around yourself under the bust and note this measurement in inches. 3) Measure the fullest part of the bust and note this measurement in inches. 4) Measure around yourself just under your arms and note this measurement in inches. 5) Measure from the top of your shoulder to the underbust band and note this measurement in inches. 6) Multiply step (1) by step (5) and divide by 288. This gives you the number of square feet of chain mail in your garment. 7) Number of Rings: Choose the ring size and type you want from the table above, and multiply step (6) by that number, and round up to the nearest 1000. This is the number of rings in your garment. 8) Pricing: Multiply step (7) by the ring price in the table, and round up to the nearest $2. This is the price of your garment, before any extras like closures, leather straps or fringes, linings, or other add-ons. 9) Delivery: Divide step (7) by 1000. This is the number of weeks it will take to knit your garment. 10) Weight: To find out how heavy your new garment will be, divide step (7) by the Weight Per 1000 Rings in the table. 11) For double-knit, double the pricing, delivery, and weight. 12) For Asian 4-in-1 knit, multiply pricing delivery and weight by 0.667. 13) To determine your actual bra size, add 5 or 6 inches to the measurement in (2) so that you get an even number. This is your band size. Subtract (4) from (3) and this is your cup size. a 1" difference is an A cup, 2" = B, 3" = C, etc.